Lightweight, Corrosion Resistant Aluminum Bleachers Provide An Economical, Maintenance Free Seating Solution For Indoor Or Outdoor Sporting Events. Bleachers are made of extruded aluminum alloy to ensure uniform strength with aluminum angle frame for durability and reinforcement. All seat boards are satin anodized to prevent oxidation or discoloring. 4 Row Bleachers include single floor planks with 5-1/2" rise. 3 & 5 Row Bleachers include single floor planks with roomier 7-1/4" rise. 1 Year Limited Warranty. Lightweight Aluminum Bleachers Tilt On-Edge To Provide Portability And Easy Relocation. 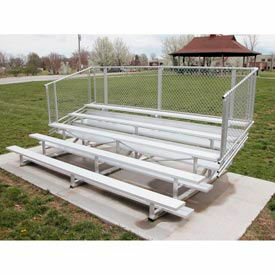 Aluminum bleachers provide an economical, maintenance free seating solution for indoor or outdoor sporting events. Features casters on the edge for easy tilt and roll mobility. Great for temporary seating applications. Allows compact storage when not in use. Portable bleachers are made of extruded aluminum alloy to ensure uniform strength with aluminum angle frame for durability and reinforcement. All seat boards are satin anodized to prevent oxidation or discoloring. 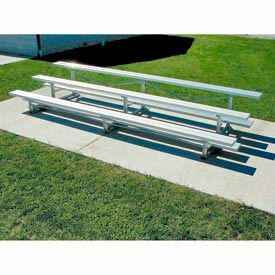 Tilt and Roll bleachers include two 4 non-marring casters and rubber skid bumpers to protect wood and rubber flooring. Corrosion Resistant Aluminum Bleachers Feature Guardrails For Spectator Safety. Lightweight aluminum bleachers provide an economical, maintenance free seating solution for indoor or outdoor sporting events. 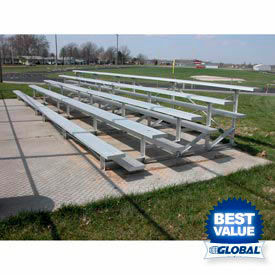 Bleachers are made of extruded aluminum alloy to ensure uniform strength with aluminum angle frame for durability and reinforcement. All seat boards are satin anodized to prevent oxidation or discoloring. Aluminum bleachers include double floor planks with 7-1/4 rise. These 5 row bleachers include 54 H guardrails for safety. 1 Year Limited Warranty.